Inter-cultural, religious & ecumenical dialogue | M.Afr. After the introductory prayer led by Martin Grenier (assistant general in charge of JPIC), the first day of our workshop was officially opened by Ignatius Anipu (assistant general in charge of Encounter and Dialogue – Ecumenism). In his opening speech, Ignatius invited the participants and all the missionaries of Africa to be active actors of ecumenism in their missionary activities. Linking the present workshop to the 150 years of the foundation of the society, Ignatius pointed out the fact that ecumenism has always been part of our charism since the lifetime of our founder Lavigerie. Andreas Göpfert, coordinator of JPIC-ED, presented the timetable of the session and the methodology which is based on SEE, JUDGE and ACT. He explained the workshop objective ‘Undertake a process which aims to deepen our ecumenical orientation and to integrate it into our missionary commitments for the care for our common home, peace, and social cohesion’. He insisted on the interconnectedness of all those topics. Frans Bouwen started off a series of presentations regarding the M.Afr and its ecumenical commitment past and present with his talk on St. Anne’s in Jerusalem as the first concrete M.Afr. commitment to ecumenism. 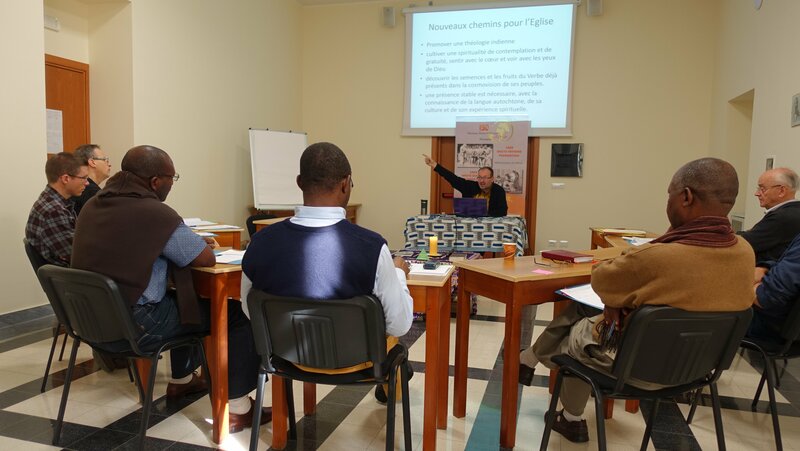 This presentation helped the participants situate themselves into the historical context of Cardinal Lavigerie and the ecumenical activities of the Society in the Middle East and with the Eastern Churches. A second presentation, given by Richard Nnyombi, focused on the evangelization of Uganda and helped the participants see that the first confreres who arrived in central Africa did so in a context of inter-religious dialogue and competition among different Christian churches. Despite conflicts which took place between Catholics and Protestants, there have been as well fruitful examples of collaboration as well as the poignant example of ‘ecumenism of blood’ as both Catholics and Anglicans martyrs were united in suffering for their faith in Christ. Ignatius Anipu offered the participants an overview of how the most recent General Chapters of the M.Afr. treated the subject of ecumenism. All were interested to learn that much more has been said about our M.Afr. commitment to ecumenism in the chapters than we previously thought. This gave rise to the question: do we take the content of our chapters seriously? Andreas Göpfert, JPIC-ED Coordinator of the Society, provided a summary of the ecumenical activities in which our confreres are involved throughout the world. He urged us all to consider how we can integrate an ecumenical dimension into each one of our M.Afr. apostolates. The second PLURIEL international congress took place in Rome from 26 to 28 June 2018 on the theme: “Islam and belonging”. PLURIEL is the University Platform for Research on Islam in Europe and Lebanon, of which PISAI is a partner. The interventions of the congress will be put online in the coming weeks. From May 9th to 13th, 2018, the big gathering of Catholics took place in Münster, in the north of Germany. Several Missionary Sisters of our Lady of Africa and several Missionaries of Africa participated. Together they welcomed many visitors to their common booth. Some sisters and confreres came from Poland to participate and to visibly enrich our internationality and interculturality. Many were the visitors who stopped in front of the stand for a personal conversation, to look for information on our missionary institutes and on Africa. Sometimes attracted by the sound of “tam-tams”, many people came out of curiosity or out of nostalgia from a previous stay in an african country, or because one or the other has an acquaintance among our sisters or confreres. On several occasions we have experienced the joy of reunion. Lost from view after so many years, the stand allowed to meet again, to meet and exchange. Apart from these interesting and rewarding encounters, the booth has conveyed messages about our missionary priorities and our various fields of apostolate. The organizers of the Catholic Rally (“Katholikentag”) invited a delegation from northern Ghana. So our confrere Mgr. Richard Baawobr, Bishop of Wa, was able to come to Münster. At a conference on intercultural dialogue, he shared his experience on Muslim-Christian dialogue. Together with Dr. Hazic Hussein Zakaria, Imam of the Quran Mosque of Tamale, they gave many examples of the dialogue lived in the society in Northern Ghana. At the conference, two experts and the public had the opportunity to pose questions to the speakers to better understand the context and interreligious practice. The challenges of dialogue are particularly at the level of mixed marriages, mixed schools attended by students of different religions and the sensitization of religious leaders at the grassroots level. Personally, I retained a message that deeply touched me: The God of love created Muslims and Christians, not so that they should fight against each other, but so that they could learn to live together and to commit together for more peace in the world. In Tanzania, the office of Justice & Peace and Inter-religious Dialogue has had several activities with the Muslim fraternity. 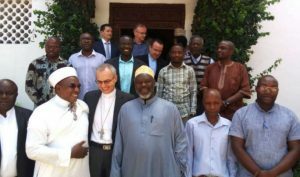 The main event was in February, 2018, when we held a two day conference on inter-religious dialogue and peacebuilding in Tanzania, with a special attention to the case of Dar es Salaam. It was a top level diplomacy approach. We invited several dignitaries from embassies and the European Union and the American cultural centre. The conference was graced by his H.E. Most Rev. Marek Solczynskinew, Apostolic Nuncio to Tanzania. The speakers and key players were university lecturers and researchers who presented very concise research findings. The Muslim leadership in Dar es Salaam was well represented and the leaders gave their views. The main event of the conference was the launching of the book on “Religious extremism and violence in Tanzania – the case of Dar es Salaam”, by Dr. Elias Opongo SJ, and Dr. Felix Phiri (M.Afr.). The conference on inter-religious dialogue in Tanzania was held at Atiman House of Missionaries of Africa. The Nuncio flanked by two Sheikhs on either side with Br. Elvis standing right behind the Nuncio. The primary objective of the conference was to analyse the situation of religious extremism and violence emerging in Tanzania in close association with the current global situation whereby many parts of the world have become destabilized by religious intolerance. 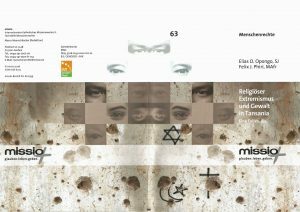 Although the Tanzanian situation could be a typical case, considering the country’s history, it could nonetheless contribute in some way not only to understanding the roots of religious extremism and violence but also in providing possible means of pre-emptying the occurrence of such incidents in the interest of a more constructive interreligious coexistence globally. At the conference, it was reported that in coastal region of Tanzania like Tanga, radicalization of the youth was slowly gaining momentum. It is a known fact that Tanzania has suffered terror attacks in the recent past. However, there are some sections of the Tanzanian civil society who do not feel comfortable to say that there is a problem of religious extremism in Tanzania, fearing that it could paint a bad image of the country. The temptation therefore is to choose to keep silent about it. Unfortunately that would not be the right approach to eradicate religious extremism in Tanzania. We need to address the problem before it gets out of hand. Feeling bad about having fundamental extremists in one’s own country is normal but choosing to keep silent about the problem is very dangerous. There is need for a paradigm shift in the analysis, and strategic response to the problem of religious extremism and violence in Tanzania. Our conference indicated that the problem of radicalization was gathering pace on the coastal area due to many factors such as perceived economic injustices, lack of employment among the youth, political power agenda, and foreign geopolitical strategic interests. In addition, it was observed that in regions like Tanga where the young population are very much exposed to wrong teaching and could easily fall victims of religious radicalisation. Another factor is the proximity between Tanga and Mombasa where the al-shabaab easily infiltrate in the local population. However, all these factors tend to hide under the guise of religious fundamentalism. We cannot deny that religion has been instrumentalized to justify these extreme acts of violence. Moreover, we need to dialogue as religious leaders of different religions and answer the question “what is our role and how can we help reduce the damage?” At the end of the conference, we all agreed that inter religious dialogue is vital in deconstructing the ideology behind religious extremism. One can say we have hope for more collaboration between Muslims and Christians (i.e. Catholics) in Dar es Salaam. Our task is to coordinate with our muslim brothers in Dar es Salaam and see how we can reach out to other coastal regions such as Tanga and help the young people to stay away from wrong teaching. The future research would look into the implementation of long term approach to addressing root-causes of religious extremism and violence; such as socio-economic and political marginalization, unemployment, victimization, uncoordinated response, and lack of effective strategy to addressing the problem. 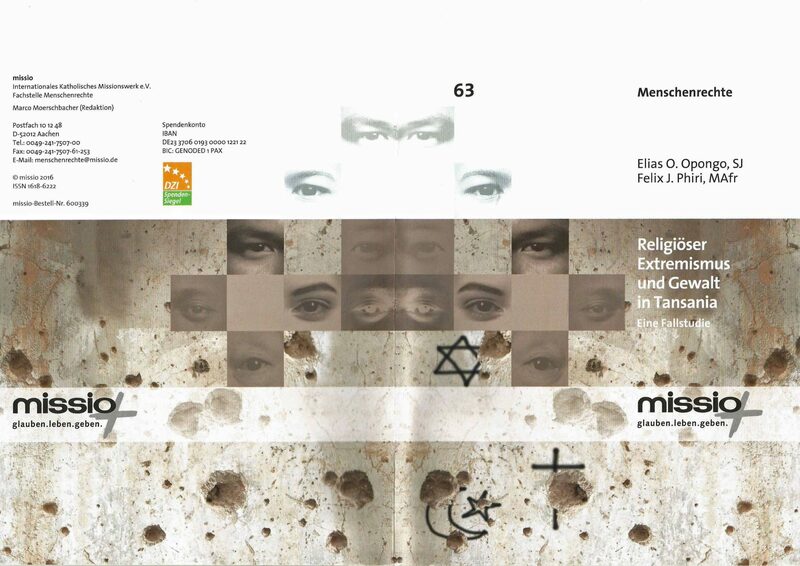 Religious extremism and violence in Tanzania – the case of Dar es Salaam, by Dr. Elias Opongo SJ, and Dr. Felix Phiri (M.Afr.) – Here the cover of the book translated in German by Missio. About the next conference, one of the researchers challenged us that most of these dialogues are conducted among elderly men. Often we exclude women and the youth. To the contrary the reports on radicalisation show a lot of young people as the major human capital. Recently, we have seen the number of women participating in radicalisation increasing too. Thus, we have to see how to engage young people and women in these dialogues. We hope to contact universities to see if we could hold round table discussions with the students at the campus and eventually hold the conference with the youth. Only in French. In the following window, right-click the links and select “open in a new tab”, otherwise they will open in the window itself. In that case, to come back to the Bulletin, right-click in the window and select return. We congratulate all our Muslim Friends who successfully completed this month of Ramadan and wish them a very happy feast of Eid el Fitr. sent to all Muslim friends at the occasion of Eid el Fitr. Eid el-Fitr, or festival of rupture, is the commemoration marking the end of Ramadan fasting. This celebration is the expression of the forgiveness granted by Allah to the Muslims who, during the month of Ramadan, were able to show their submission in order to atone for their sins of the past year. 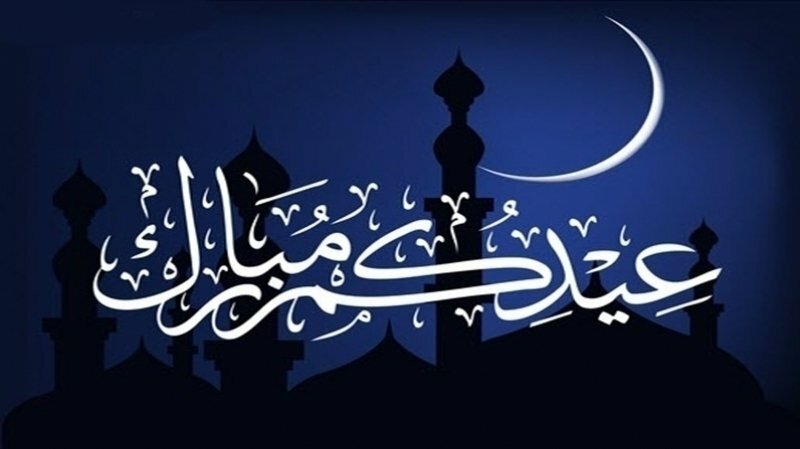 When he created the ceremonial attached to Eid al-Fitr, Muhammad (Mohammed in French) insisted on the attitude of righteousness and piety that was to be attached to it so that the believers could begin a new year in the most Virtuous. Aid al-Fitr marks the end of the fast of Ramadan. It is customary to start this festive day at dawn by going to the mosque for the first prayer of the day. This is an opportunity for children to receive new clothes and gifts. It is also a time of reunion and charity. It is good visiting one’s parents, one’s friends and celebrating around this feast, but it is also important to make gifts to the needy and to share.